I’m Marie Segares from Underground Crafter and I’m happy to be back on Oombawka Design for the second post in my charity spotlight series. Each month, I’m highlighting a charity that accepts crochet donations and sharing a free pattern, so read on for details. Nearly everyone knows someone who has had cancer. Every year, about 1.8 million people are diagnosed with cancer in the U.S. and Canada alone. In the U.S., over 650,000 people with cancer receive chemotherapy treatments in an outpatient setting each year. If you’ve ever spent time in a treatment setting, you know that the temperatures are generally cold and unforgiving, even when you’re healthy. One of the major side effects of chemotherapy and other cancer treatments is hair loss. Hair loss makes your scalp very sensitive to temperature and other sensations. The drawstring on this beanie ensures a snug fit while also adding a little style. One way that crocheters can support people going through cancer treatment is by partnering with this month’s featured charity, Halos of Hope. Halos of Hope volunteers distribute crocheted, knitted, and sewn caps to over 450 cancer centers each month. By working with local yarn shops, crochet and knitting guilds, community groups, and the annual STITCHES events, Halos of Hope is able to extend their reach. To donate, you can send hats to the Halos of Hope office in Arizona, or use their Find a Center search to find a cancer treatment center in the U.S. that accepts donations. The best “chemo caps” are made with love using soft yarn with minimal seaming. Remember that patients will have very sensitive scalps. Chemotherapy has a strong impact on the immune system, so patients will often machine wash and dry anything worn in treatment to remove germs. For all of these reasons, extra care must be taken when choosing yarns. Softness is the most important factor, followed by ease of care. A yarn that can be worn by patients with environmental or chemical sensitivities is the icing on the cake! 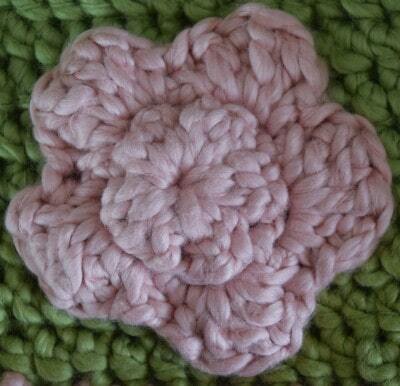 For this pattern, I used Lion Brand Nature’s Choice Organic Cotton Yarn. In addition to being extra soft, it can be delicately machine washed and is appropriate for most patients with allergies and chemical sensitivities. Since cotton yarn can shrink unpredictably, I designed this hat to feature a drawstring tie that keeps it firmly on the head. I also added a small yarrow flower embellishment. Many cultures around the world have historically associated yarrow with healing and health. The drawstring on this soft and seamless hat adds a touch of style and ensures a perfect fit. 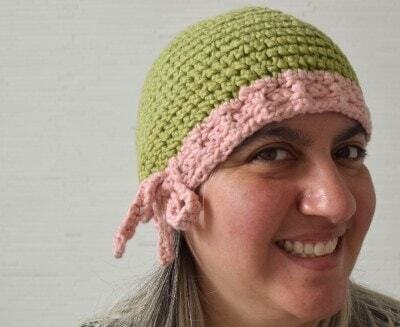 Listed circumferences are slightly larger than typical crochet hats to allow for cotton yarn shrinkage. If you are substituting with an acrylic yarn, please choose a smaller size based on your preferred final circumference. Lion Brand Nature’s Choice Organic Cotton (3 oz/85 g/103 yds/94 m/100% organic cotton) – 1 skein ea in 170 Pistachio (CA) and 101 Strawberry (CB), or approximately 103 yds (94 m) in ea of 2 colors in any medium weight yarn. J-10 (6 mm) crochet hook or any size needed to obtain gauge. Rnds 1-5 in pattern = 4” (10 cm). For best fit, always check your gauge. cl – cluster – (Yo, insert hook in ring, yo and draw up a loop, yo and draw through 2 loops) twice, yo and draw through 3 loops. Hat is worked in rounds in continuous spirals without joining until Rnd 13. Move stitch marker up each round to mark last st.
Rnd 9: *Inc in next st, hdcFL in next 7 sts; rep from * around. (72 sts) CHILD/TEEN SIZE ONLY: Continue to Rnd 12. Rnd 10: *Inc in next st, hdcFL in next 8 sts; rep from * around. (80 sts) ADULT SMALL SIZE ONLY: Continue to Rnd 12. Rnd 12: HdcFL in ea st around. Rep Rnd 12 until hat measures approximately 0.5” (1.3 cm) shorter than finished length, changing to CB in last yo of last hdc of last rnd, fasten off CA. Rnd 13: HdcFL in ea st around to last 3 sts, scFL in next st, sl st in ea of next 2 sts, join with sl st to first hdc. Rnd 14: Ch 3 (counts as hdc + ch-1 sp), sk 1, *hdc in next st, ch 1, sk 1; rep from * around, join with sl st to second ch of beginning ch 3. Rnd 15: Ch 1, sc in same st and in ea ch-1 sp and sc around, join with sl st to first sc. Fasten off CB. With CB, make a chain measuring approximately 12” – 18” (30.5 – 46 cm) longer than finished circumference. Turn, sk first ch, sc in ea st across. Fasten off. With CB, ch 4, sk 3, join with sl st to first ch to form ring. Rnd 1: (WS) Ch 1, (cl in ring, ch 1) 5 times, join with sl st to top of first cl. Rnd 2: Turn to RS, starting in same ch-1 sp (sl st in ch-1 sp, ch 3) 5 times, join with sl st to first sl st.
Rnd 3: (Sc, 4 dc, sc) in ea ch-3 sp around, join with sl st to top of first sc. Fasten off with 12” (30.5 cm) yarn tail for seaming. Starting at back of hat with mid-section of drawstring, weave drawstring through ch-1 sp in Rnd 14 of hat so that loose ends are positioned at front. Using yarn needle and long yarn tail, sew yarrow flower to side of hat. With yarn needle, weave in ends. Tie drawstring to fit. If you’d like to crochet a prayer shawl for a patient, consider my free Pineapples for Everyone Shawl pattern, which can be easily customized with different yarn weights. 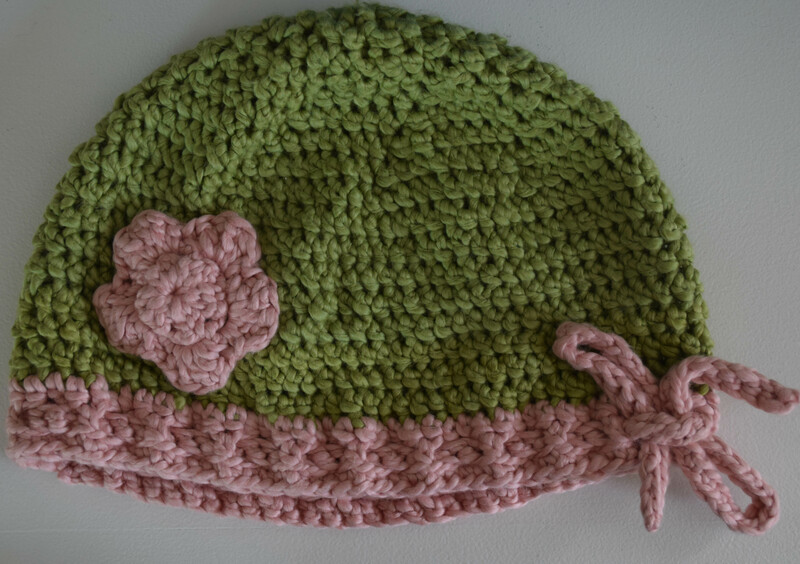 On behalf of the Oombawka Design readers, and myself, I would like to Thank Marie for sharing information about the Charity Halos of Hope and for sharing her lovely design – Drawstring Beanie with Yarrow Flower. Cancer is a terrible illness and one which has touched too many of us, in one way or another. Sending healing thoughts, and prayers of hope to those who are currently battling this disease and to those who are caring for their loved ones. I would also like to thank each and every one of you who offers your time to make items to donate to Charity for those in need. Together we are stronger! What a great pattern! Thank you for sharing this and sharing the charity as well.